Their release on an unsuspecting public was rather understated but soon word spread about the intensity of the bunch, its street-smart and aggressive leader, and the toughness that embodied the group. With their leader marked for elimination and their own institution's identity at risk, rival gangs united against the Warriors' cause. Yet the group boldly took all all comers in pursuit of their destiny. A destiny of triumph, vindication and redemption. From start to finish the Warriors captivated America before emerging as the unexpected champions - - against so many odds. The team was pushed to the brink of madness as they fought to maintain unity through the disappointment of early losses. 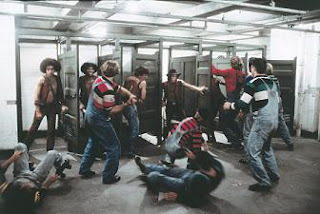 Some Warriors turned against one another, leading to an infamous locker room brawl late in the season. Still, the Warriors overcame the setbacks, remained unified and earned more victories than defeats during their memorable series of battles that year. Yet their work was not done. The Warriors had not secured their destiny, their new home turf. As the gauntlet continued, the madness of the season intensified. 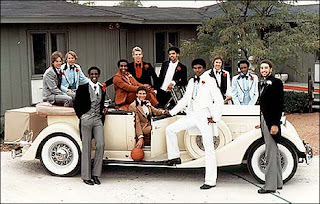 The Warriors had near-elimination experiences against the Furies, the Hi-Hats, the Boppers, the Lizzies, the Turnbull AC's and the Gramercy Riffs before reaching their final destination. The opposition was most fierce in the closing moments when the good guys where challenged to a pair of memorable battles on the promised land for all to see. The Warriors did not back down. When foolishly challenged by an unworthy opponent with gimmicky weaponry and a nortorious baiting call, "Warriors, come out to play-i-ay!" -- play they did. The renegade bunch turned the tables and rallied late to earn an emotional triump, forever solidifying the Warriors as 1977's most enduring phenomenon with a legacy that still captures the imagination three decades later. This Saturday, let's honor the Warriors once again. Just a note to this website, it says on the right margin that we are 22-9 and we are really 22-8! No biggy just thought I should point that out so you guys could change that. (after saturday though, we will be 23-8)! That number is a projected season ending record from the Pomeroy projecting site. Lets hope it ends up 23-8. Easily the best post on this site yet. Can you dig it?? ?